After finding the makings of a complementary filter in the KK2.0 flight controller firmware and enabling it on the Talon Quad, I've been flying it for several days to test out the fast angle control. I've heard from a number of other people who have tried it with mixed results. Several people got it working, confirming that the self-leveling is faster and doesn't overshoot like crazy. But since it has, in at least two cases, lead to crashes, I'll just reiterate the warning that the modified firmware should be considered experimental and tested at ones own risk! One thing that's 100% certain is that the self-level is set up for small angles. Do not expect it to recover from any position at any time. Do not try to fly acrobatically with self-level on. For one, the accelerometer component is mixed in only for angles that are less than a certain deviation from the horizontal. There's some confusion about what the maximum angle for which accelerometers are factored in is - I would guess based on my reading of the code that it's 26º. Unfortunately it was not that easy. It works very well as long as no yaw is commanded when the craft is not level, as seen in the video earlier in the thread. If yaw is applied when not level, both roll and pitch angles change, but roll/pitch gyros does not sense this rotation, resulting in wrong angles. Try for your self with a airplane model in your hand. In short: only yaw when level. Mathematically it makes sense. If you do happen to yaw while within the 26º (?) envelope, the accelerometer readings can still help the angles recover over time. But the fast gyro update is lost. If you yaw while outside the 26º envelope, all bets are off. Since my flying is decidedly conservative, it's possible that the problem had just never come up. So, more aggressive flying is called for. I felt comfortable enough to put the GoPro back on. It's basically indestructible anyway, and it's a good way of registering the angle of the quad. You can see that I attempted, mostly successfully, some long moderately banked turns. This seems like the most likely scenario where a yaw + roll input would occur and where the sensors have enough time to stray from correct values. While in the turns, I had no trouble maintaining attitude. Coming out of the turns and returning to level flight was a bit trickier (I had one unintentional landing resulting in no damage), but not at all impossible. Granted, I never really got past 30º in the banked turns. It could start to fail more catastrophically at steeper angles. But the ironic thing is that, until now, I've never felt comfortable enough with the performance of the self-leveling to even attempt these maneuvers. I can also fly nose-in and at larger height with much more confidence thanks to the faster and more stable angle control. I can think of ways to handle the yaw + roll and yaw + pitch inputs at small angles (45º or less), and they only require math that the ATmega324PA should be able to handle. Maybe I will dig into the assembly more and try to implement something. 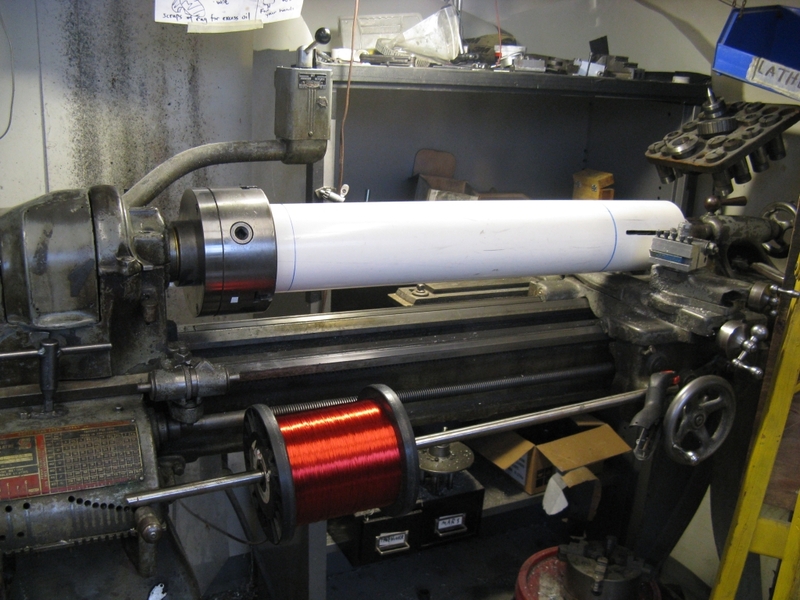 But, 4pcb has lived this long with nothing but independent pitch/roll complementary filters. 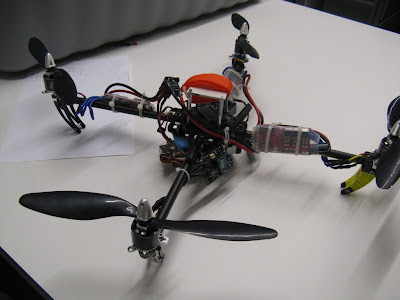 (Not that it's the most smooth-flying thing in the world...) Some day I'd like to make my own flight controller from scratch, maybe with a bit more fancy math on a 32-bit processor. But right now this is working very well for me. 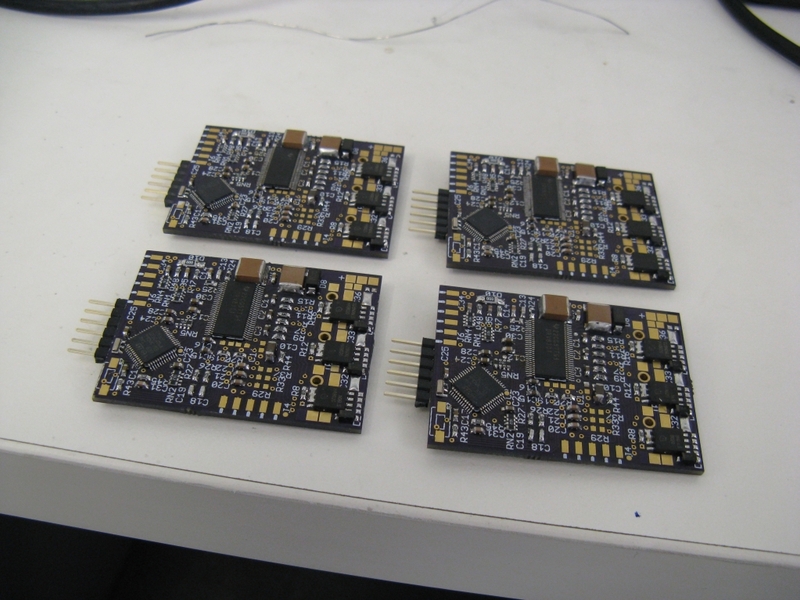 After successfully testing one FFv1.2s motor controller on the Talon quad, I got enough parts to complete a full set of six. 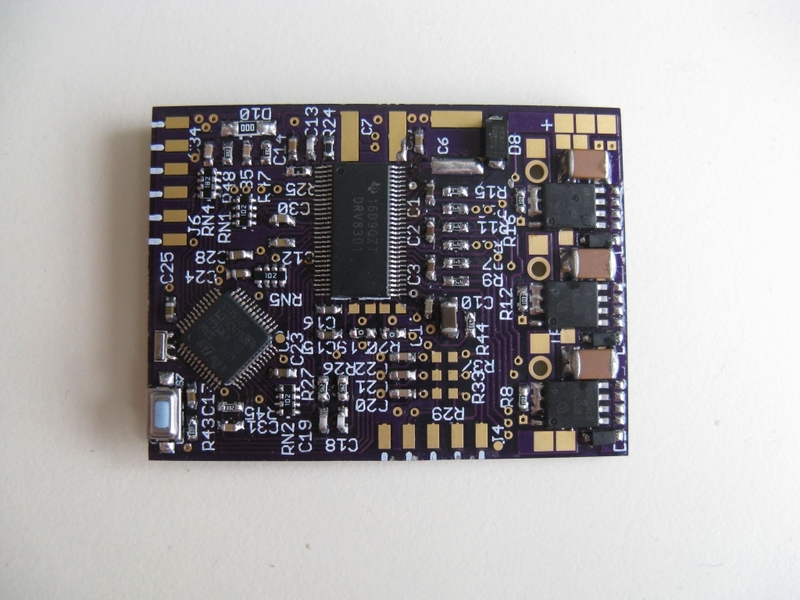 The overall dimensions are 2.00in x 1.50in x 7mm and 11.3g for the FFv1.2s board alone. 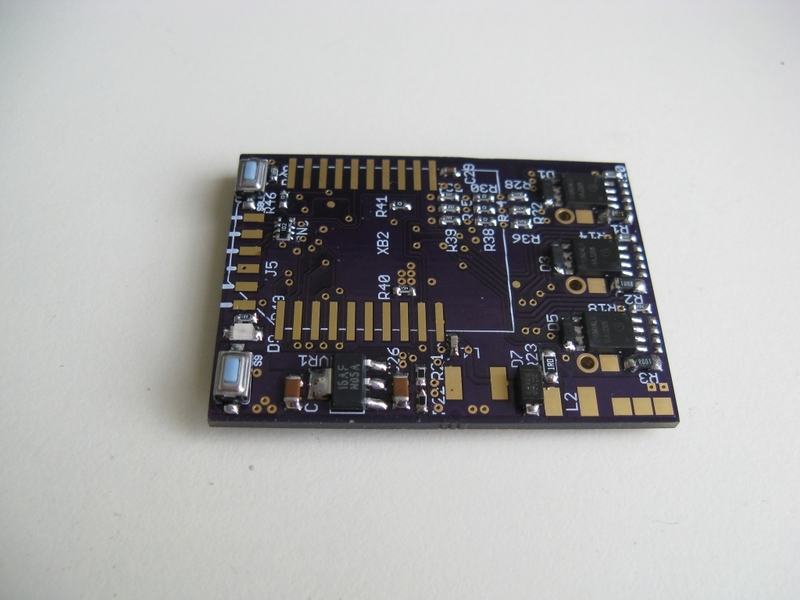 (FFv1.1 board-only dimensions are 3.00in x 1.50in x 12mm and 28.4g.) With 16AWG wiring, an external DC bus capacitor, and connectors, the FFv1.2s controller weighs in at 35.1g. This makes it a much better fit for the Talon quad than the 66.0g FFv1.1 with giant D2Pak-7 FETs at 14AWG wiring. With a cameo by Twitch. 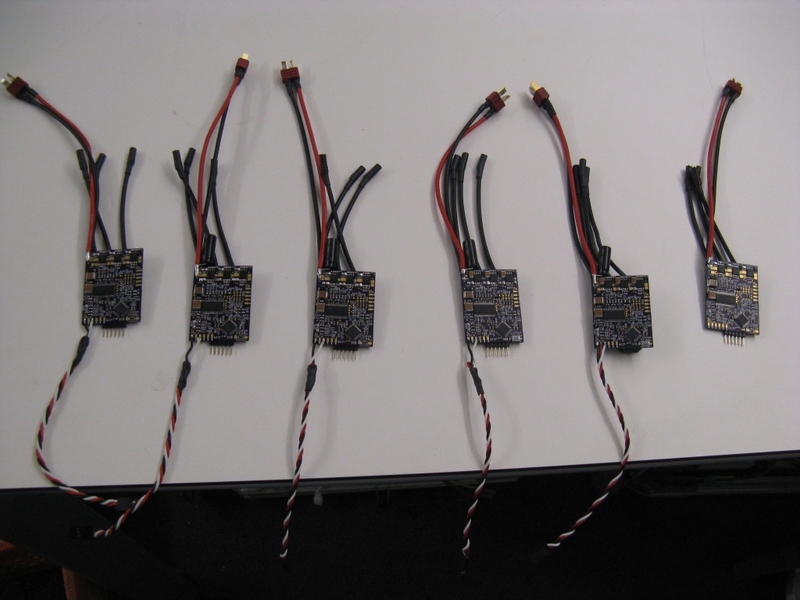 I also switched back to the KK2.0 flight controller to make the Talon quad as light as possible. (You will see why in a bit...) I did a bit of firmware hacking on the KK2.0 to enable the fast angle estimate, which I describe in the previous post. The result is quite amazing: it now has very precise and fast angle control. After the first indoor test from the previous post, I have been further tuning it and flying outside. It's wonderfully stable and easy to fly now, even in some wind. It shows several seconds of rapid back-and-forth roll inputs, followed by a few seconds of hovering, then a few seconds of climb. The RPM tracks well, although there are some small and rapid oscillations similar to what can be sort-of seen in the indoor test video. The oscillations are especially apparent in the current data. This is, I suspect, because the inner rate loop gains were slightly too high. Testing in the wind with lower rate P gain yielded much smoother flight (still with wonderful fast self-leveling). The reason for reverting to the lightest possible configuration for the Talon wasn't to go easy on the new controllers, though. It was to try an ambitious payload. 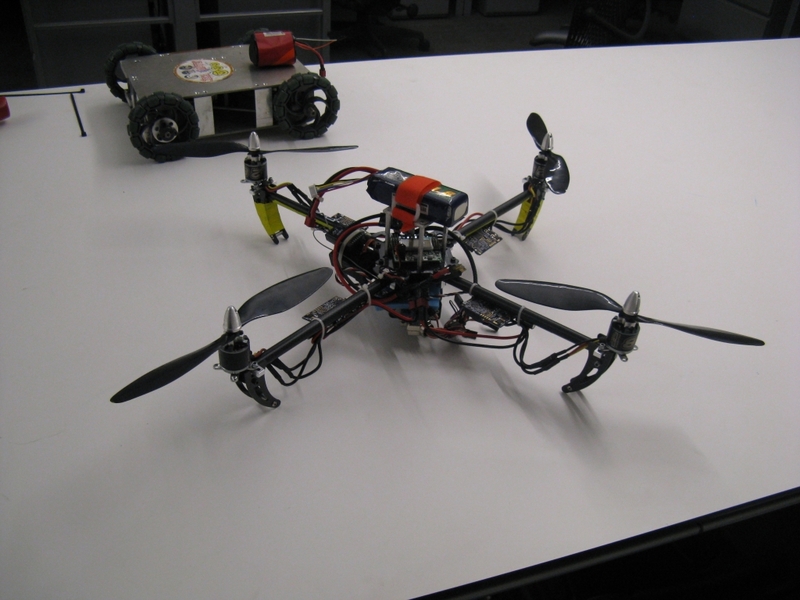 This quad normally carries a GoPro camera, which weighs about 200g with its impact-resistant case. The heaviest thing it's carried is my handheld video camera, at 300g. But with the new motors, I suspect it could carry a lot more. Enter TOBL2. I've been watching Texas Instruments' line of motor drive chips for a while now. 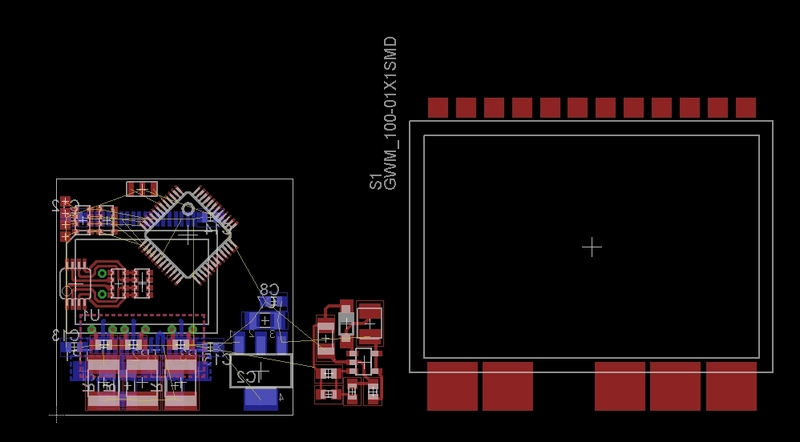 In addition to the DRV8301, which has performed flawlessly as a gate driver / current sense amplifier / buck converter controller on FFv1.1 and FFv1.2s, I've been wanting to try out the DRV8332. The DRV8332 is a fully integrated three-phase driver, meaning logic-in / FET half bridge-out. 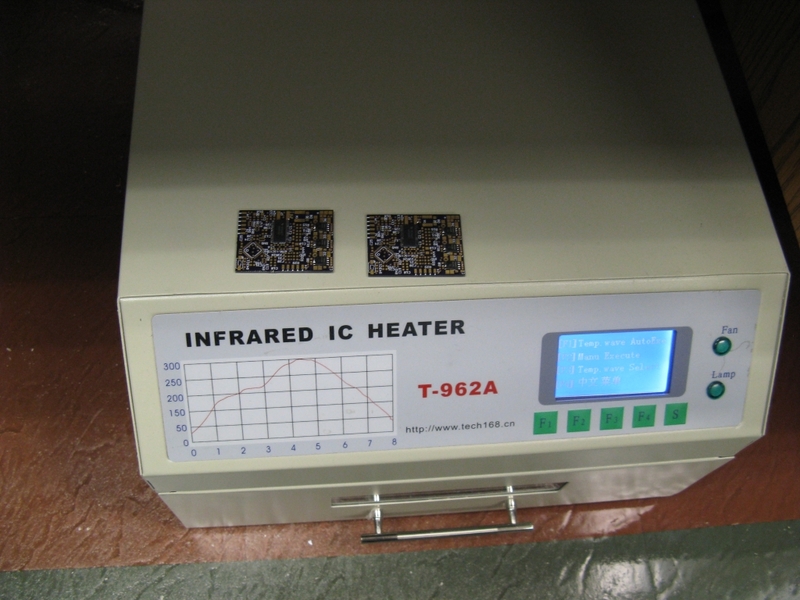 It goes up to 50V and the heatsinkable version (8332) has a phase current rating of 8A continuous, 13A peak. The MSOP-8 on the left side of the board is a dual op-amp, configured for low-side current sense differential inputs using two resistor networks. I really liked this layout. The cluster of components on the right side of the board are two switching power supplies. 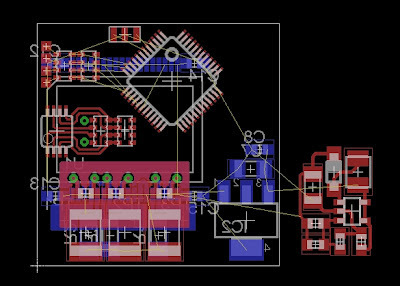 The first, a wide-input buck converter based on the LT3991-5, would allow me to take full advantage of the 50V input range of the DRV8332 while still supplying an efficient 5V/500mA BEC for logic and receiver power. 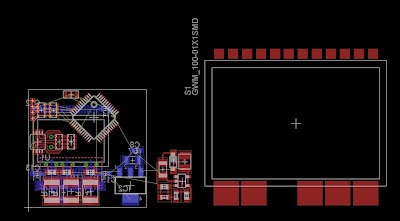 The second, a tiny boost converter based on the LT3460, would supply 12V/100mA for the gate drive. Sadly, that's as far as I got before shelving this design. It has a fundamental flaw that I hadn't considered until this point: the FETs in the DRV8332 are not that great. Even though its current rating says it would be a viable controller for something the size of the Talon quad, the FET losses make it not worth it. Even at a relatively modest phase current amplitude of 5A, the 80mΩ per-phase resistance would add 3W of total dissipation to the controller (with sinusoidal commutation). Compare this to the minuscule 0.075W that FFv1.2s would dissipate with with its Super SO-8 FETs. At 150W/kg, the rough power-to-weight ratio for the Talon quad, the extra 2.9W of dissipation would be equivalent to 19.3g of weight. So, to justify the tradeoff, the FFv1.3ss board would have to weigh 19.3g (or more) less than the FFv1.2s. (Assuming the wiring and capacitors weights are fixed, as they would be for a given current.) Since the FFv1.2s boards are only 11.3g, excluding wiring and caps, there is no way the extra dissipation of the FFv1.3ss is justified. Factoring in the weight of the necessary heat sink for the DRV8332, I'm not sure there is a likely scenario where it would be justified based on a power-to-weight analysis. If volume is weighted more highly than weight, as it might be for some other applications like a mini robot, the DRV8332 might win out. It might also be justified on size alone at very low current where the efficiency is less of an issue. But in that case, there are things like the Toshiba TB6588FG that I used on 4pcb which could probably do the job. It's too bad, because I was really starting to like this layout. But it seems like it wasn't meant to be, as far as flying things are concerned. 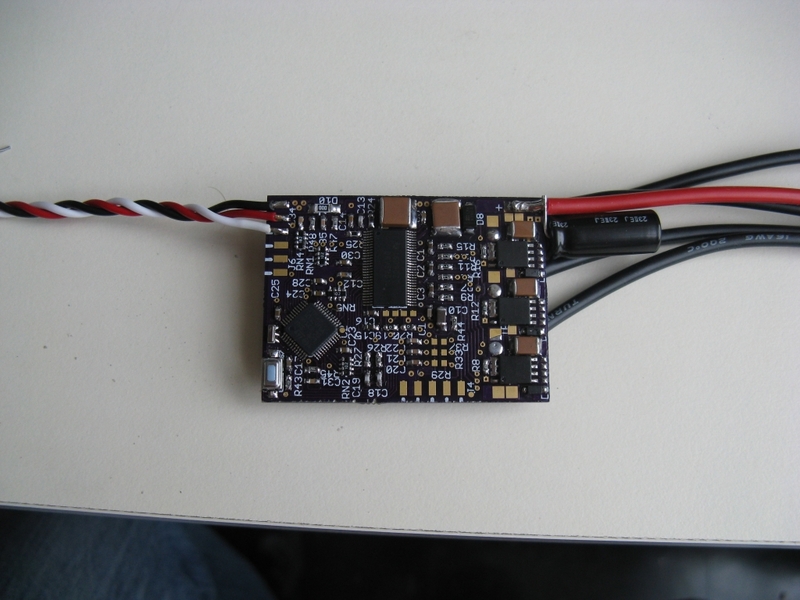 The KK2.0 is HobbyKing's ultra-cheap ($30) multirotor flight controller, which I bought a few of for testing some time ago. Unlike its predecessor, the KK2.0 has a full 6DOF IMU with an InvenSense 3-axis gyro and an Analog Devices three-axis accelerometer. That means it should be fully-capable of doing angle control (a.k.a. attitude control, self-leveling), where the joystick axes correspond to a commanded pitch and roll angle, and center-stick returns the multirotor to level. 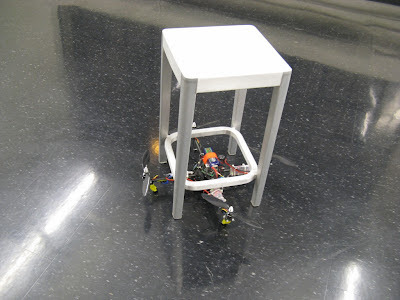 This is in contrast to rate control, where the joystick axes correspond to a commanded pitch and roll rate, and center-stick holds the current angle (but does not return the quadrotor to level). Rate control is good for doing tricks and flips, but angle control is better in most other cases when you want to stay within say +/-30º of horizontal. 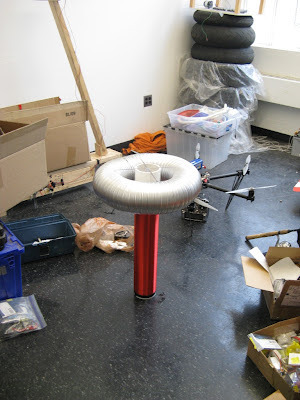 If you get disoriented, you can go to center-stick and know that the quadrotor will return to level and not go rocketing off into the distance. It's also more well-suited to camera platforms, since it helps maintain a level horizon. The KK2.0 has a "self-leveling" feature that I was very eager to try, but I was a little disappointed in the performance. It was sluggish, and increasing the gains to make it return to level faster would lead to pendulum-like behavior, especially in the wind. It would eventually return to level, but not before overshooting back and forth a couple times. Q: Why is Autolevel so slow? A: The autolevel is based only on the ACC. It takes some time before the ACC registers tilt due to the horizontal acceleration of the craft when tilting. It needs some speed to get air resistance and a force on the ACC. Therefore the autolevel works best on draggy crafts. Later I will try to implement a AHRS algorithm, which uses both ACC and gyros to get a immediate tilt angle. This all sounds very familiar. I have explored the specific problem of creating an angle estimate using both accelerometers and gyros at length on many projects, using a technique known as a complementary filter. I used it on all the self-balancing things I've built or helped build, as well as two quadrotors: 4pcb and the original Edgerton Center copter. Tangent: Two complementary filter implementations in simple code. I won't go into the theoretical details here, since they are well-explained in several of the links above, but I will put forward the typical code snippet I use to implement the complementary filter on a single axis of the accelerometer/gyro data. It takes as its input the gyro rate (gyro_rate) and the accelerometer angle (acc_angle), pre-converted into compatible units (deg and deg/s, or rad and rad/s, for example). The accelerometer angle can be calculated with an arctan function or by linearization for small angles. and it depends on the loop time. Larger time constant trusts the gyro for longer and filters the accelerometer more. Making this time constant long enough to overcome the time required for buildup of aerodynamic drag mentioned in tuning FAQ is the key. However, if the gyro rate has a lot of bias, a time constant that is too large can lead to offset in the angle estimate. Unwrapping the math to show that this is equivalent to Implementation #1 above is a little tricky, but it definitely works out. The nice thing about Implementation #2 is that it's just two low-pass filters, a multiply, and an add. It could be done entirely in analog hardware if one so desired. Ok but what does this have to do with the KK2.0? And I label it as Implementation #3 because in fact, if you rearrange the math, you get exactly the same thing as the other two. This version is formulated more as an error feedback approach, which is intuitive. The strange thing about this complementary filter isn't that it's written in a different way...it's that it's entirely commented out! The complementary-filtered angle estimate (I call it filtered_angle, the firmware uses GyroAnglePitch and GyroAngleRoll) is never used. 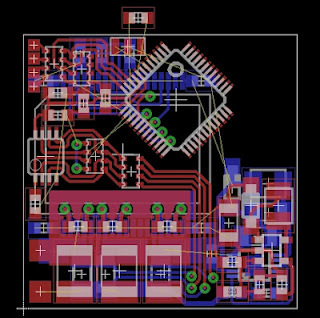 Instead, the self-leveling angle estimate is straight from the accelerometer (what I call acc_angle, and the firmware calls AccAnglePitch and AccAngleRoll). And that's it. Here is the modified firmware I used. No other changes were made to the project. If you want to stare at the code or rebuild the project yourself, you'll need AVR Studio. Otherwise, KK2_1V2_modS.hex is the file to be flashed. Note: Use at your own risk! Most likely, this is a future upgrade that may not be fully ready yet! The stick response is very fast. Going back to center gives very fast return to level, with no overshoot and no pendulum effect. 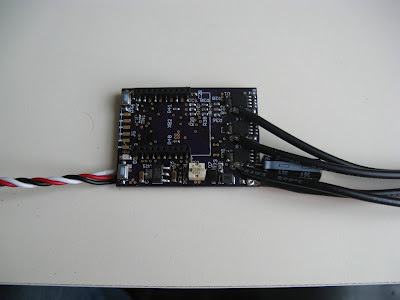 It now flies as well or better than other (way more expensive) flight controllers I've tried. I'm sure that by tuning the complementary filter time constant, the self-level P gain and the inner rate loop PI gains, I could get it to be even better. So now my $30 flight controller looks like an incredibly good deal. 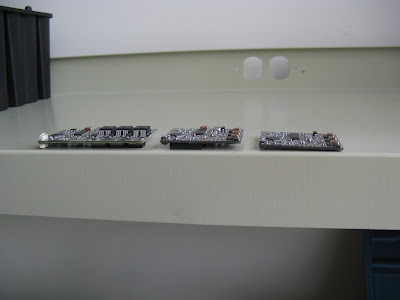 The boards are from OSH Park (formerly DorkbotPDX PCB Order, you might be able to tell by the color scheme). It's a terrific deal for small boards: $5/in^2 for three boards. For example, this board was 3in^2, so I got six for $30. The total time from order to delivery was a bit under three weeks. 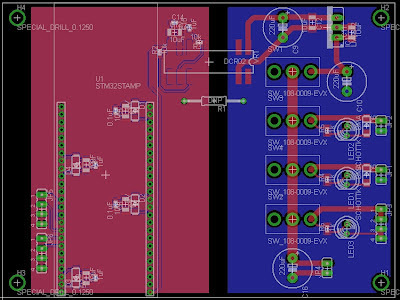 These boards have exactly the same logic section as v1.1, but an entirely redesigned, smaller power section. Instead of massive D2Pak-7 FETs, it uses Super SO-8s. These are extremely popular in RC ESCs because of their low cost, relatively high power density, and thin package (more compact and easier to heat sink). I'll be trying two different FETs: the Infineon BSC016N04LS G (40V, 1.6mΩ) and BSC028N06LS3 G (60V, 2.8mΩ). One difficulty with using Super SO-8 FETs is that, although it's possible to solder them from the sides, good thermal performance will probably only be possible if the drain pad under the chip is reflowed. 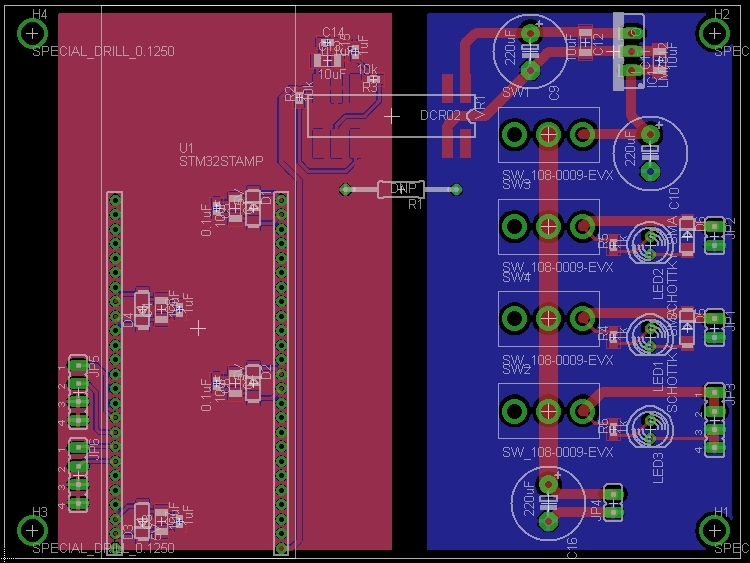 The DRV8301 magic chip needs its ground pad reflowed anyway, so this doesn't add any extra steps for me. It's just one trip to the bagel toaster. The left-most board is a v1.1 without any wires or external capacitors. The middle board is v1.2s with XBee headers fitted. The right-most board is v1.2s with no XBee headers. In the smallest configuration, it's 7mm in thickness. 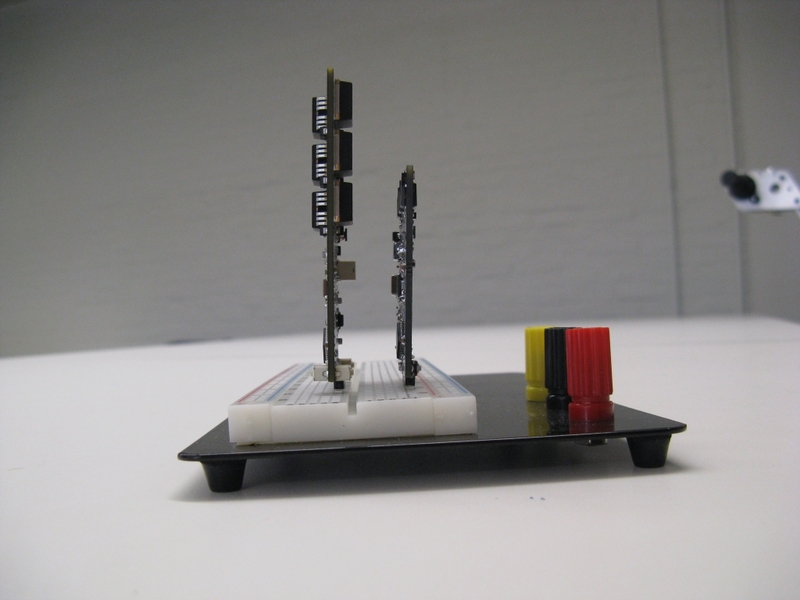 The tallest components are now the three pushbuttons, and even those are lower profile versions of the ones in v1.1. The first assembled board survived power-up without exploding, so therefore it was flightworthy. With the ground firmware working well on a few test vehicles, I've moved back to the air firmware for the FFv1.1 motor controllers. 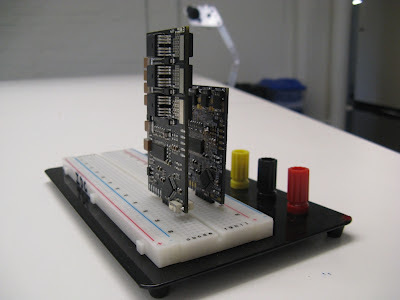 (My motor controller page has finally been updated!) The challenge for the past week was to get the air firmware working in closed-loop RPM mode on the Talon quad, which has nice new motors and a new flight controller for testing. Closed-loop RPM means that the input signal, a servo-style PWM pulse, commands a specific motor speed. 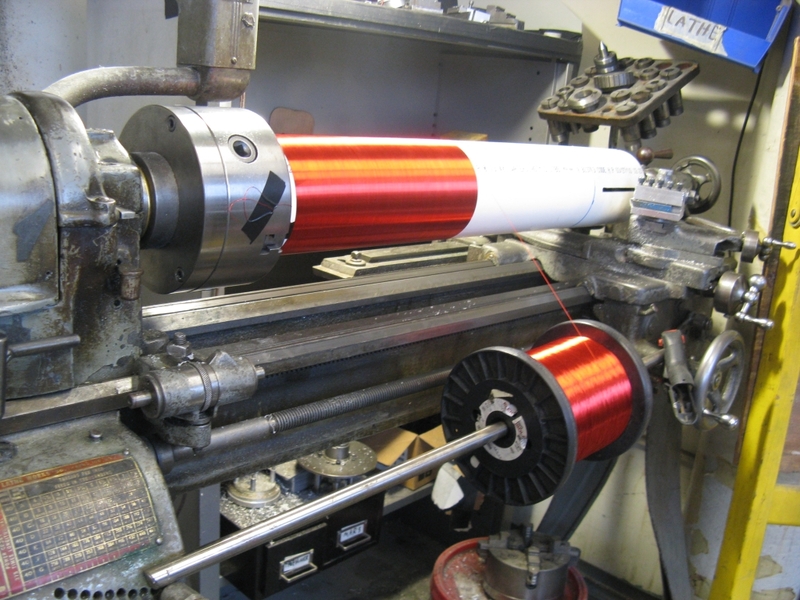 (For example, 1200-1800μs could be mapped to 0-5000rpm.) In RC helicopter terminology, this is called "governor mode" and would be used to hold the rotor speed constant as the blade pitch is varied. 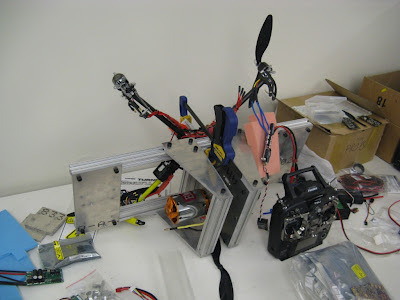 It's not typically used on multirotors, since they have fixed-pitch propellers. But there are some performance advantages if it works well. It's also an interesting control system challenge, so I had to try it. The downsides of direct duty cycle control are that it offers no chance to limit motor current and it can't compensate for IR drop or slight differences in motors. Most of the multirotors I've used have cheap motors, and there's always one that's just a little worse than the others... Closed-loop RPM control can solve this problem by ensuring that the same command causes all the motors to spin at the same speed. The feedforward term goes from RPM command directly to the current command, bypassing the PID (or in this case, PI only) controller. In steady state, motor current is proportional to the square of motor speed, due to the aerodynamic drag on the propeller. The target current is therefore set to the expected steady state current for a given RPM command, plus a P.I. term to handle transient (accelerating) current and any offset from the expected value. The constant of proportionality for the feedforward path is determined experimentally. The speed-squared relationship of aerodynamic drag has other consequences for the closed-loop controller: 1) The damping ratio of the plant increases with speed. and 2) The damping ratio is different for increasing and decreasing speed steps. 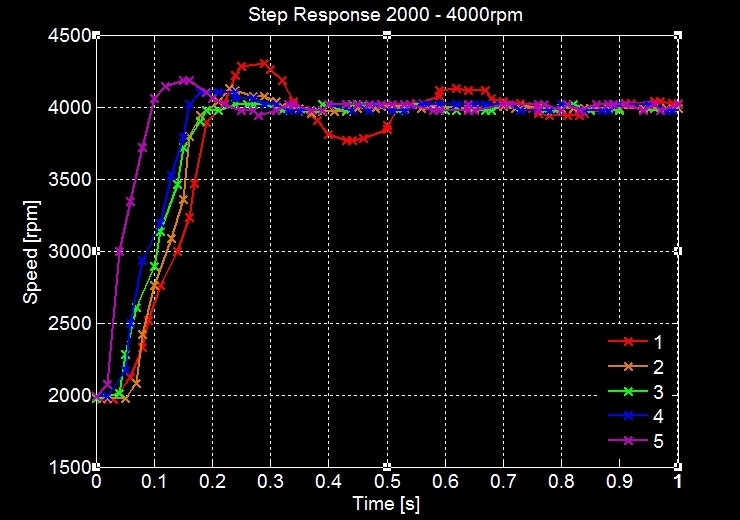 To deal with these effects, I made the gains for the outer PI loop speed-dependent and asymmetric. I don't like speed-dependent gains, but in this case it seems unavoidable for achieving good performance over a large speed range. Higher speeds get higher gains. Increasing speed gets a higher gain than decreasing speed. The new feedforward structure, combined with speed-dependent gains for the RPM controller, improved the performance a lot. 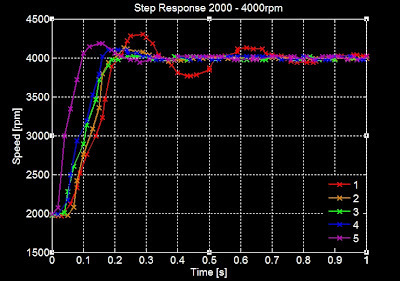 As a baseline, I implemented this scheme on the new Talon motors and tuned the PI gains to get the RPM step response as fast as possible. To confirm this baseline, I put all the gains and plant specifications into a simulation of the controller/motor/prop system. What I found was that the real-life system was oscillating a lot more than the simulation, with the same gains. That meant there was an unaccounted-for bandwidth limit in the real controller. I spent a day tracking it down. I had already accounted for both the current and the RPM measurement filters, so it had to be something else. The bandwidth-limiting element turned out to be the high-speed position filter I added a while ago. Above a certain speed, it merges the interpolated electrical angle with the angle indicated by a flux observer zero-crossing. At constant speed, the error between these two angles should be zero mean and the filter doesn't cause any lag. But during acceleration, the interpolated angle will lag the true angle by some amount. This lag was causing oscillation in the D-Axis current controller, which in turn was limiting the overall closed-loop bandwidth. Changed the RPM estimator from updating once every mechanical cycle (7 electrical cycles) to once every 3 electrical cycles. This decreases the effective low-pass filter time constant in the RPM feedback path. The tradeoff is RPM resolution at high speeds, but 3 cycles seems like a reasonable compromise. Result of this change is Plot #3. The small overshoot in Plot #2 is eliminated. Doubled the gains. The result was a slight increase in rise time, but the overshoot also returned (Plot #4). It was clear that increasing the gains more would bring back oscillations. In some sense, this feedforward path is exactly the direct duty cycle control from before. 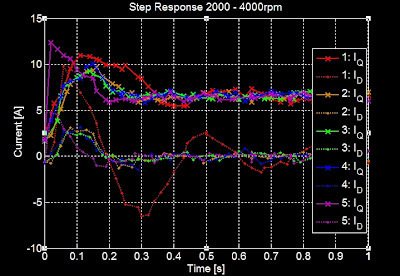 A step increase in RPM immediately increases the duty cycle to the value that would be expected to produce that RPM in steady state. The output doesn't have to wait for the RPM or current error to build up, so the gains of the feedback controllers can be kept lower. There is a downside, which is that the feedforward path bypasses the current limit. 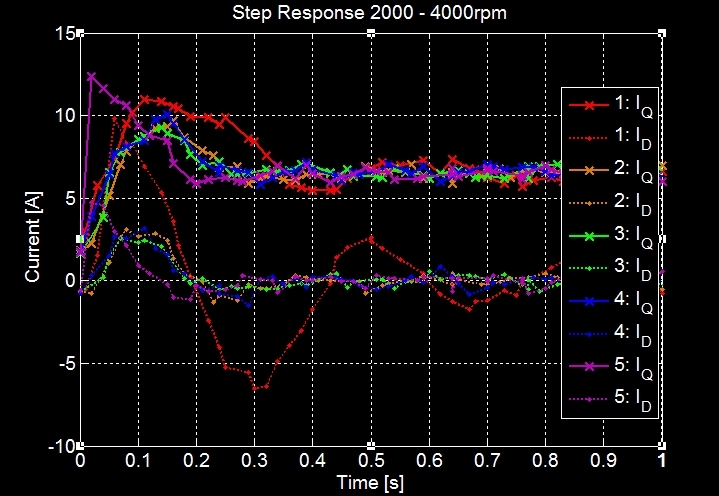 In the case of a large step increase in RPM command with a low-resistance motor, a short burst of current over the limit could occur before the PI controller has a chance to compensate for it. Depending on the system, a slew-rate limit on the feedforward path could be used to prevent this. Plot #5 shows the effect of the RPM-to-voltage feedforward path. The 0-100% rise time is cut to under 100ms with acceptable overshoot and very little oscillation. The Q-Axis current instantly rises, rather than building up, giving a short burst of torque to speed up the motor. In this case, the current pulse seems within reason for what the MOSFETs can handle (although what's plotted is filtered current - the instantaneous value on the time scale of one PWM cycle is higher). In total it took about 2-3 hours to do. Definitely tedious work, but not as bad as winding a motor I think. I calculated that if I had turned the lathe on it would have been done in 7.5 minutes. But, it also might have snapped halfway through and ruined the whole thing. It would also have been difficult to check for crossed turns at that rate. I'm sure that with practice it could be done. CineStar 6 and 2x4 Scooter, for scale. I will probably coat the windings in polyurethane finish to protect them. But otherwise, the secondary is done! In the design, I talked a bit about the driver's power electronics but I hadn't quite finished the signal board's layout at that point. 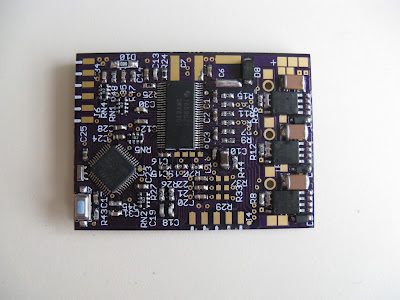 The signal board is actually pretty simple: it will use one of the wootstick 2.0 STM32F103C4 dev boards that I used for several motor controllers. The wireless programming may come in handy for this project. As far as the STM32F103C4 is concerned, its only job is to drive four LEDs in short bursts of square waves, which is the beauty of optocoupled gate drive. 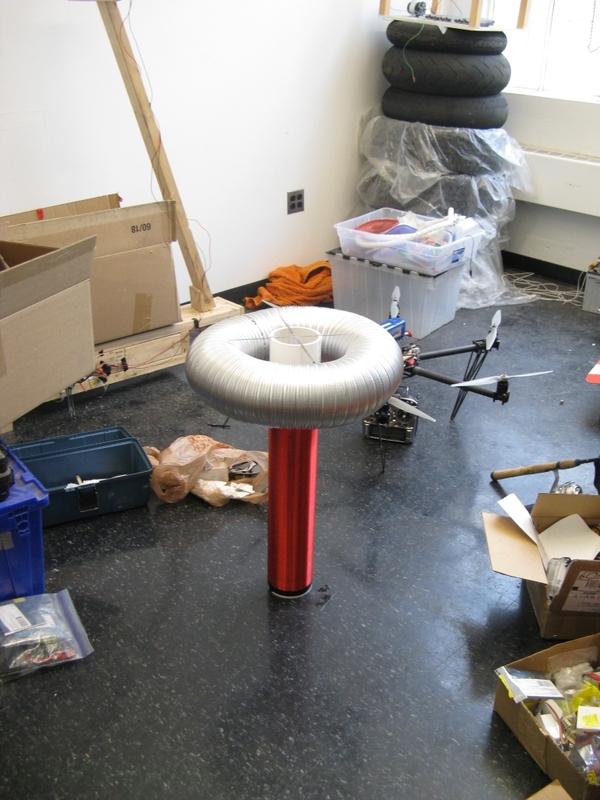 It should, ideally, have no idea that it's connected to Tesla coil power electronics. I will attempt to get it running at 72MHz so I have plenty of time resolution for fine-tuning the drive frequency. The left-hand side of the board has the wootstick 2.0 board and LED gate drive outputs. The right-hand side has some switches for driving a precharge relay, main contactor, and gate drivers from a separate 14.8V battery. The two sides are connected by an isolated 12V-to-5V logic supply (DCR021205). The tricky bit will be connecting this board, which will be some distance from the coil, with the power board, which will be heatsinked to the coil base. The plan for now is to use a series of shielded 3-wire cables: two for the gate drive signals and one for 15V power to the gate drivers. The good news is that the gate drive signals are fairly low impedance, since they have to drive LEDs. That should make them less susceptible to EMI. The bad news is that the entire thing could still get stuck by an arc. 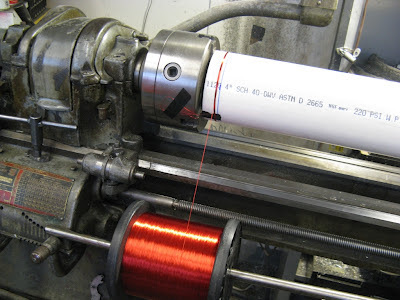 So, around the set of three cables for some distance out from the coil, I will add an outer shield to secondary (coil) ground. Next up: building the primary and the base.